If your current laptop seems to be slowing down lately, hold off on spending hundreds of dollars on a brand new computer. Why? Because there’s a good chance you can make your current notebook feel like new by installing a blazing-fast SSD drive in place of your old hard drive. 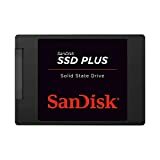 Amazon is running a terrific deal right now that gets you a SanDisk SSD PLUS 240GB Internal SSD for just $35. This awesome SSD has read and write speeds of up to 530MB/s and 440MB/s, respectively. Note that those speed ratings are megaBYTES, not megaBITS — this thing is insanely fast!